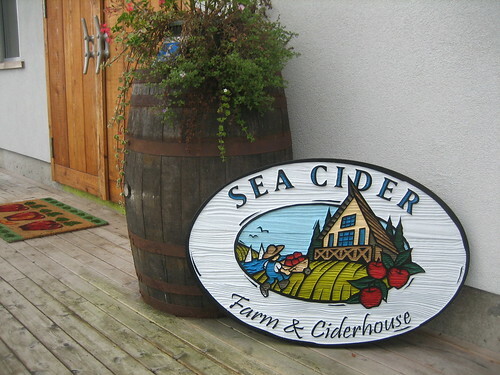 When I visited Sea Cider the first time, I was surprised to discover that I had driven by it literally hundreds of times as I made my way back and forth between Victoria and the peninsula. Just a jog off the highway, opposite the Waddling Dog, down a smaller road followed by a dirt driveway and you arrive at the gorgeous apple orchard-bordered property that is Sea Cider. The space is pretty spectacular - the tasting room is a large barn-like space with high ceilings and a wrap-around deck. In the summer, garage-like doors open up to create an even larger space. The tables are long and wooden, and the chandeliers are massive wrought iron pieces that really make the space feel epic. Yes, they do weddings! I am a bit torn about the service aspect. In some ways, our first experience felt slightly more personal and informative - the ciders were brought to our table and poured with a brief description and piece of information for each one. This allowed us to sample each one at appropriate temperature as they were poured and form an opinion quickly about our favourites. This time, the ciders arrived pre-poured with a little piece of paper with tasting and pairing notes on our table. This may just be a logistics thing, but I definitely preferred the first for the level of information. That being said, perhaps I with my my insatiable thirst for learning new things about what I do not already know am not their target market. Our guest from out of town who joined us, said that although the temperature change as they warmed to room temperature did affect the taste of the ciders she appreciated not having tasting notes taught to her. We have been fans of Sea Cider since we had the very first year's vintage of the Rumrunner (which was massively different from the version that exists now) that rendered us giggly, euphoric and obsessed. We have visited the property for tastings and special events a few times over the years. I am not sure if it is just that our taste has changed, or the fact that the person making the cider has changed, or just a fact of small-batch production but we were not as in love with the cider we sampled this season as we have in the past. It was still quite good, but in the past we noted really clear, crisp tastes and smells that separated the ciders from each other. This time, those seemed more muted and the ciders were all closer to the middle and so a little less distinctively what I imagine as 'sea cider' brand. Still, the experience of the tasting is good and the product is solid. The venue is gorgeous, and great for a lazy afternoon sipping cider and enjoying the view. It's a great place to take a visitor from out of town if they are looking for the best kind of agri-tourism the Island has to offer. I highly recommend the tasting plate as a good accompaniment to the cider flight. The cheeses are fantastic, many of them local, and there is a good selection of other accompaniments as well - chutney and brittle. This photograph is of the chorizo option, but there is also a candied salmon option as well.